The acrid smell of coal is one of the first things that strikes you in Katowice, Poland. This seemed a rather incongruous setting for the 24th session of the Conference of the Parties to the UNFCCC, aka COP24, which convened at the beginning of December 2018. Much was expected from this COP, including the production of a so-called Rulebook on how to implement the provisions of the Paris Agreement. And for the most part COP24 did deliver this ‘Paris Rulebook’, which provides a consensus on the operationalisation of the Paris Agreement from 2020 onwards. While this progress should be celebrated, the work of the Parties is far from complete. The only agenda item not agreed in the Paris Rule book is Article 6 which deals with market mechanisms. Delegates were not able to reach agreement and hence the issue was pushed to the next conference, which will be held in Chile at the end of this year. During the COP meetings, official negotiators make progress by agreeing the language of pre-drafted texts. COP24 started with nearly 3,000 square brackets on the draft Paris Rulebook, indicating 3,000 parts of the text not yet agreed. The ultimate goal is a clean text with no square brackets, indicating that a consensus has been reached by all who participated in its drafting. Getting a clean text is no easy feat and the nifty chart below from Carbon Brief illustrates some of the rulebook sections that proved most difficult to resolve. 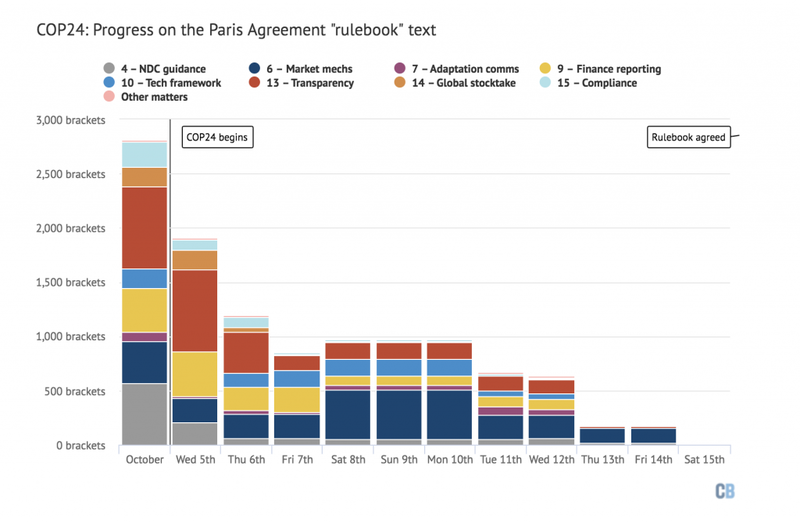 Carbon Brief took the number of square brackets in negotiating texts for the rulebook before and during COP24. For example, the rules on transparency under Article 13, which cover reporting of greenhouse gas emissions and progress in tackling them, started with the most brackets. The number of outstanding square brackets was reduced dramatically during the course of the two weeks, and in the end the issues between Parties were resolved – save for issues relating to Article 6. Parties clashed on many points of Article 6, which deals with market mechanisms, from basic accounting rules on how to avoid ‘double counting’ of emissions reductions to what the transition from the Clean Development Mechanism will look like with regards to projects, credits and methodologies. This means that the role of carbon markets and international voluntary cooperation remains open in the context of the Paris Agreement and is now scheduled to be resolved at COP25 at the end of this year. While this is disappointing, it’s perhaps better to have no deal at this time, rather than a weak one. Dubbed the Katowice Climate Package, the Paris Rulebook provides a framework for tracking and reporting greenhouse gas (GHG) emissions and calls for Parties to implement more ambitious climate goals on a regular and on-going basis. It also affirms financial support to help developing countries to implement mitigation and adaptation measures. Many of the guidelines and rules agreed to at COP24 provide for the harmonisation of communication and reporting to the UNFCCC. This includes collecting information and comparing efforts towards achieving the global climate goals of the Paris Agreement in countries’ Nationally Determined Contributions (NDCs) through implementation as well as on finance and support. Standardising communication is necessary if the Global Stocktake, as mandated in Article 14, is to become a useful tool to verify progress. The first stocktake is scheduled for 2023. The newly established Biennial Transparency Report (BTR) on information tracking is mandatory for all countries and the first BTRs are due in December 2024. The content of the BTR will included information on GHG emissions inventory, NDC implementation progress tracking, mitigation and adaptation action, GHG emissions projections, as well as support provided, needed and received. This will be difficult for many developing countries with limited capacity but allows countries the flexibility to indicate which requirements they cannot meet, plus describe how they will improve their reporting capacities in the future. A process to establish new climate finance reporting modalities as part of the Transparency Framework was established and creates a single set of reporting requirements that applies to all Parties, but distinguishes between developed countries that have an obligation to report and other countries that are invited to report. While an agreement on climate finance reporting sounds great in principle, one glaring thing missing here in the Paris Rulebook is a definition of climate finance as there is no internationally agreed UNFCCC definition. It also doesn’t define reporting standards and making comparisons between countries will prove challenging as every country has different accounting and reporting practices for climate finance. A recent OECD Climate Finance Report shows that public climate finance from developed to developing countries continues to increase but falls significantly short of the commitment made in 2009 at COP15 in Copenhagen to mobilise $ 100 billion annually in climate finance by 2020. Yet more money is being committed by multi-lateral development banks (MDBs) and developed countries. For example, at COP24 the World Bank announced that it will make about $200 billion available to fund action on climate change from 2021-2025, helping countries adapt to the effects of warming and reduce greenhouse gas emissions. And the Green Climate Fund won strong endorsement at COP24 by receiving top-level support from Germany and Norway, both announced doubling support contributions for GCF. During the three years since the Fund has been approving climate projects, it has committed $ 4.6 billion to 93 projects in 96 countries. The positive signalling commitments of MDBs and developed countries is encouraging but it still falls short of the funds required. The private sector could play a more central role and work in partnership with governments and MDBs to find more financial solutions. In conclusion, Parties managed to deliver a robust set of guidelines for implementing the Paris Agreement and countries now urgently need to start intensive national discussions and live up to their responsibilities because there is still much work to be done. 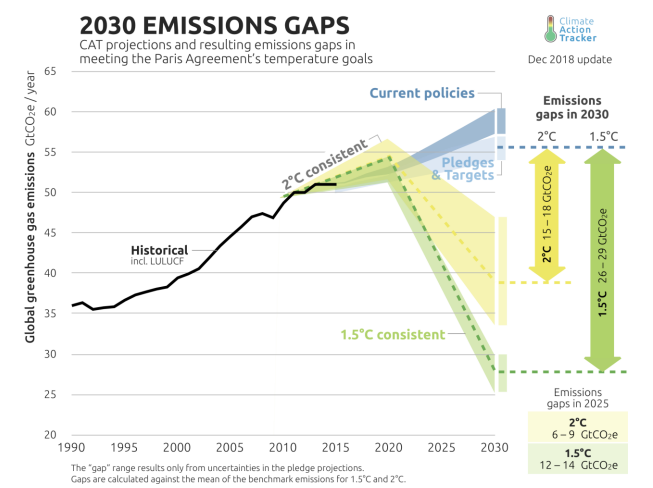 The 2030 Emissions Gap Report by Carbon Action Tracker below illustrates the expected absolute emissions in 2020, 2025 and 2030 and compares these with benchmark emissions consistent with benchmark pathways in line with the temperature goals in the Paris Agreement. As of December 2018 a substantial gap remains between the levels of emissions in 2025 and 2030 projected in the NDCs submitted to the UNFCCC and the lower levels that would be consistent with the temperature goal in the Paris Agreement. Here at CMIA we’ll be monitoring the evolution of the Paris Rulebook, including keeping a close eye on market mechanism developments in Article 6 to be agreed at the end of this year. It was great to see many of you in Katowice and I hope to represent CMIA again at COP25 in Chile at the end of the year. Drop me an email if you want to get into contact with us: margaret.splawn@cmia.net.